The United National Party, often referred to as the UNP Sinhalese: එක්සත් ජාතික පක්ෂය (pronounced Eksath Jathika Pakshaya), Tamil: ஐக்கிய தேசியக் கட்சி), is a leading political party in Sri Lanka. It currently is the main opposition party in Sri Lanka and is headed by Ranil Wickremesinghe. 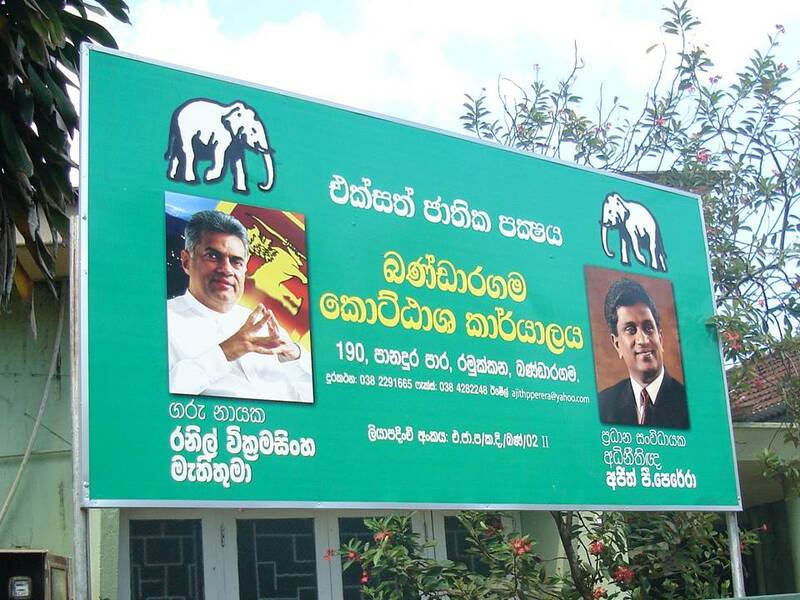 The UNP is considered to have right-leaning, business friendly policies. The UNP was founded on 6 September 1946 by amalgamating three right-leaning pro-dominion parties from the majority Sinhalese community and minority Tamil and Muslim communities. It was founded by Don Stephen Senanayake, who was in the forefront in the struggle for independence from the United Kingdom, having resigned from the Ceylon National Congress because he disagreed with its revised aim of ‘the achieving of freedom’ from the British Empire. The UNP represented the business community and the landed gentry. However, Senanayake also adopted populist policies that made the party accepted in the grassroots level. The UNP campaigned in the 1947 general election on a platform of dominion under the United Kingdom and protecting the traditional way of life and Buddhism, the religion followed by the majority of the people, from communist threats from the left-wing opposition parties (the Lanka Sama Samaja Party and the Communist Party of Ceylon). Ceylon became a dominion in 1948, with D.S. Senanayake as the first prime minister. He followed a pro-West, anti-Communist foreign policy much to the ire of the Soviet Union. In 1952 Prime Minister Senanayake died from a riding accident and his son Dudley became Prime Minister. This irked long standing UNP stalwart S.W.R.D. Bandaranaike, a Buddhist nationalist leader known for his cente-left views. Bandaranaike quit the party to found the Sri Lanka Freedom Party (SLFP) as a balancing force between the UNP and Marxist parties. By this time there was growing disaffection with the UNP particularly because of its support of minority religious groups, most notably Catholics, to the consternation of the predominantly Buddhist Sinhalese. Bandaranaike was able to take advantage and lead the SLFP to victory in the 1956 elections. Soon afterwards he passed the controversial Sinhala Only Act, which led to communal clashes in 1958. The UNP again came to power in 1965 under Dudley Senanayake, but it lost in 1970 to the SLFP, which had formed an electoral alliance with Marxist parties known as the United Front. After Dudley’s death in 1973, Jayewardene became leader of the UNP and started reorganizing the party at the grass roots level. General disaffection with the economic policies of the United Front coalition and its brutal crackdown against a 1971 Maoist insurrection by the JVP brought the UNP to power in 1977. The party won an unprecedented five-sixths of the seats in parliament – one of the most lopsided victories ever in a democratic election and out of proportion to the actual number of votes it received. Jayewardene opened up the economy and revolutionized the entire outlook of the country. He introduced a new constitution, which made the presidency an executive post with sweeping powers, and shifted from the premiership to the presidency in 1978. On the economic front, free-market policies have worked well. Free-trade zones were established in order to generate employment and unemployment was reduced by the openings in Middle East. The government undertook massive development work to promote hydroelectricity and agriculture. In 1982 the government held a referendum to extend parliament’s life amid widespread vote-rigging and voter intimidation. Meanwhile, separatist Tamil rebels in the north and eastern provinces were leading an insurgency for a separate state for Tamils. In July 1983, after a rebel attack in Jaffna which killed 13 soldiers of Rajarata Rifles there were communal riots in many parts of the country. The Tamil rebel groups were allegedly trained and armed by India, angry with Jayewardene’s pro-American policy. The JVP began an intense attack on government forces in hope of a socialist revolution, but this turned out to be an utter failure. The intensive offensive crushed the rebels. JVP leader Rohana Wijeweera was captured by the armed forces in custody. Meanwhile Jayewardene signed an Indo-Sri Lankan pact with Indian Prime Minister Rajiv Gandhi, which later resulted in Gandhi’s assassination. Jayewardene retired in 1988 and was succeeded by Prime Minister Ranasinghe Premadasa, a populist leader from the lower class known for his anti-Indian sentiment. He initiated many housing projects and poverty alleviation programs that made him popular among grassroots level. In 1993 Premadasa was assassinated by separatist LTTE suicide cadres while proceeding in a May Day rally. In the 1994 election, the SLFP gained control of parliament after 17 years of unbroken UNP rule. While in opposition many of UNP stalwarts were killed by an LTTE suicide terrorist attack during an election rally which saw the assassination of Gamini Dissanayake, the UNP’s presidential candidate. This paved the way for an easy victory for Chandrika Kumaratunga of the SLFP. Party leadership passed to Ranil Wickremasinghe, a relatively young politician with pro-west views and penchant for neo-liberal economic policies. By 2001 country was facing the worst economic downturn since independence, with rising inflation and an acute power crisis. The GDP was shrinking by 2.5%. The SLFP government fell on a no-confidence motion by the opposition, which prompted President Kumaratunga to call for early elections. Wickaramasinghe managed to secure the support of former government big wigs most notably former Kumaratunga confidants, Prof. G.L. Peris, and S.B. Dissanayake who would later become important members in the party. The UNP easily came to power in the 2001 election in a platform of peace with LTTE and economic resurgence, and won all but one district in the country. Wickremasinghe became the Prime Minister for the second time following the election and began a “cooperative” government with President Kumaratunga. Within two months into his premiership Wickramasinghe signed a pivotal ceasefire agreement with the LTTE. The agreement was followed by intense peace negotiations towards a final solution to the ethnic conflict. The UNP government maintained strict fiscal discipline and market-friendly policies, which led to a resurgence in the economy leading to large scale investments and rapid economic growth. The government created key economic institutions such as the Board of Investment, the Ministry for Small and Rural Enterprises, and the Information Communication Technology Agency. All this led to unprecedented economic growth reaching almost 6% at the end of 2003; inflation too was at an all time low of less than 2%. Many local and foreign experts believed that Sri Lanka at current pace would reach double digit economic growth within a few years. Unfortunately for Wickramasinghe and the UNP government, constant cease-fire breaches by the LTTE, including the constant stream of assassinations of military spies paved the way for nationalistic factions such as the JVP and its other cover organizations such as the Patriotic National Movement (Deesha Hithaishi Jathika Viyaparaya) to organize protests. They tried to convince the public that Wickramasinghe was giving too much away to the LTTE. Hardline Sinhalese Buddhist organizations such as the Sihala Urumaya (Sinhalese Heritage) criticized the government on the same lines and also for allegedly pandering to western evangelistic Christian organizations and thereby encouraging proselytizing and endangering Buddhism. The Sihala Urumaya would later rename themselves as Jathika Hela Urumaya (National Sinhalese Heritage) and put forward Buddhist Monks to contest in elections. In late 2003 the President took over the National Lotteries Board. The UNP blocked this move by surrounding the government press so that the gazette could not be printed. As a retaliatory move the President then took over the ministries of Mass Communications, Defence, and the Ministry of Internal Affairs, while Prime Minister Wickramasinghe was in visiting George W. Bush in Washington DC. Kumaratunga and her confidants launched a massive media attack on their nominal partners, branding Wickramasinghe as a traitor and accusing the UNP government of “selling” national heritage sites to foreigners. Early in 2004, the SLFP and JVP formed the United People’s Freedom Alliance (UPFA), signalling the beginning of the end for the UNP government. In February 2004, within 24 hours of a well rehearsed speech for national unity, Kumaratunga dissolved parliament. 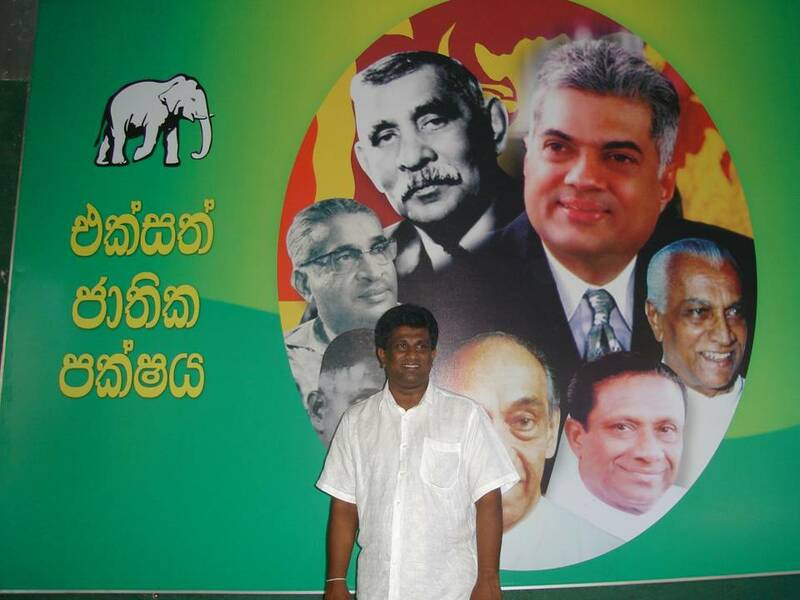 In the subsequent election on 2 April 2004, the UNP was defeated by the UPFA. Wickramasinghe remained as leader of the UNP. In the presidential election of 17 November, its candidate, Ranil Wickremesinghe, came second with 48.43% of the vote. So it resulted in a defeat and a win for the UPFA candidate Mahinda Rajapakse. It is widely believed that if not for the boycott of the polls in the North and parts of the East, allegedly due to LTTE intimidation, Wickramsinghe would have won. In early 2007, 18 senior members of the UNP joined President Mahinda Rajapakse’s ruling coalition. All of them were given ministerial positions. This resulted in a state of political unrest, as the Memorandum of Understanding (MoU) signed between the President and the UNP leader in late 2006 was read as no longer valid. This incident, generally recorded in the press as ‘crossovers’, also resulted in a state where a number of senior government ministers expressed concern over the ‘jumbo cabinet’ of ministers. All the UNP seniors should be blamed as if they were not suckers for the SLFP tricks they would not have created splits in the strong party. One must remember everyone has to do its bit to come to power and wipe out the entire JVP & SLFP and the CWC. These are the ones who always ruin the country after what the UNP does. 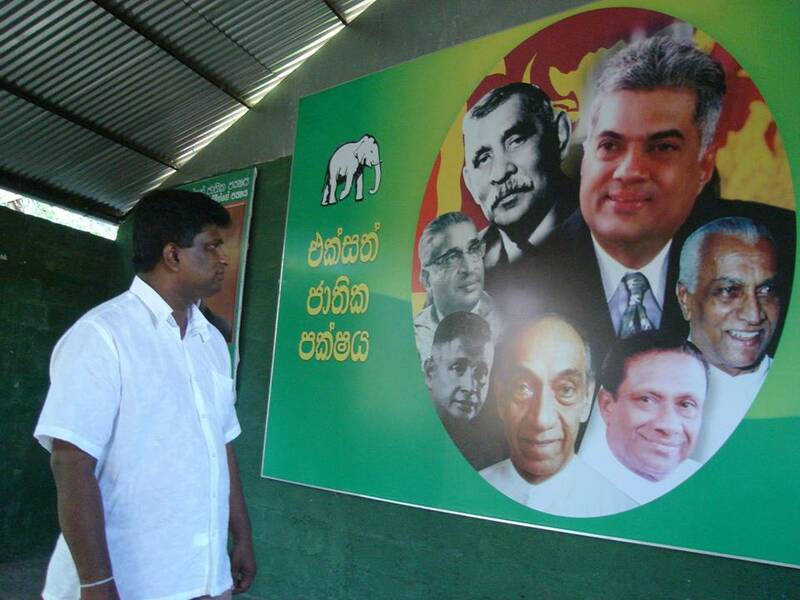 Best wishes for the UNP. Hoping and praying , some change will take place. 1) Recently I travelled in Kurunegala area. Stopped by many way side boutiques and kiosks and inquired about the elections due. 90 % replied that the Sandhanaya will win. You see, the problem with the UNP , is that they address mainly the educated middle and upper middle lass and forget the majority of the lesser. Sandhanaya , whether it is Carboard Wansa , the President himself, address the gallery, with war rhetoric and what not. They have more votes than the Mid / upper Mid classes. Net result is that UNP loses. Good example is NCP, Sabaragamuwa, the Chief ministerial candidates got more preferences , but net victory was to Sandhanaya. Recently however, I have seen few speakers give good speeches. Way to go. 2) : What about this constitutional council. Can’t we ask the Supreme Court for some direction on this. This is ridiculous, the Chief Executive and the Government , acting contrary to the Law of the Land / Constitution. 3) If UNP loses the Central and Wayamba ( I think it is near impossible to win, immediately after War win and so on ) will these guys again cry for Ranil to be ousted ?. In case of losing election, are not the Area organisers and the local leaders more responsible than Ranil ?. I can say if Ranil loses Colombo then there is some valid argument, but none otherwise. 4) How do we know if Karu J coming back was engineered by Chintanaya , to create more problems within the UNP , before a probable General Election after April, 2009 ?. UNP need a better vision. They should act like real Sri Lankans but not like American bootlickers..